“Coming Home” with all the good things from old. October Painting 2018 available to purchase check out paintings page. My love of the country and old things come from great memories, grandmothers house, aunts and uncles visiting, playing with your cousins and siblings. I love remembering and painting memories that bring back great feelings. As we get older the memories mean even more to us. As kids we grow up and think that life is forever but as the years catch up with us, we have a sense that maybe life is somewhat faster than we imagined. Its so important to take the time to smell those roses, sit and watch the sunset, feel the water in the beach, pick up the shells and really look at them. Cherish the times when we can. Sometimes we get to the time in our lives we are running out of time to do all we want. However, since none of us know how much time we do have it is so much more important to start today and tell the ones you love how you feel. Do the things you always wanted to do. For me one of the things I love besides my family is my painting and their are so many paintings I want to paint. So many memories to capture. I am learning about marketing so that takes time away from my art. Each day I try to learn the marketing part but always making sure to give my painting the time it deserves and the time I need to spend with the painting. I wish I never had to sleep - I would paint 24/7 but we know we must sleep so I paint in my dreams. My children and grand kids are motivation for my paintings too, my lil grand daughter here is Lissie what I call her and she needs medical attention with her lymphdema and my goal is to build a studio and heated pool facilities so that she can get therapy right here and not have to travel each day for it. My goal with my paintings is to paint and use all I do to help her along with helping others too that need the help. That's who I am and that's what I do is help the children. Do you see the love in those eyes - and depends on me and I know she does. I will succeed in this quest to paint for the children. 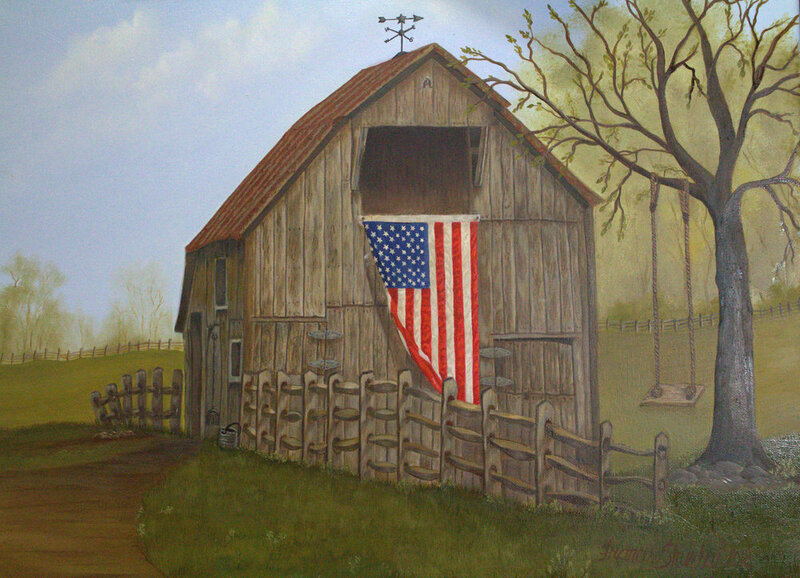 I hope you love the new barn painting coming up soon. With all the things in it that I hope you love or remember as much as I do. Tiny little things to hopefully bring back some of the childhood and adult memories you just want to be reminded of. I will be updating some sneak peeks on Facebook, twitter and Instagram and please let me know what you think. Please follow me and I will follow you back to keep in touch. I also do commission art if you are interested. Thanks for taking time to sit and read my update. I appreciate each of you and I know how much time is valued so thanks for your time you set aside to read more.